NEIGHBORS is an original comedy (which doesn’t happen too often these days) written by Andrew Jay Cohen and Brendan O’Brien. The movie stars Seth Rogen as Mac Radner, a recently married man with a newborn, and Zac Efron as Teddy Sanders who is the president of the fraternity that just moved next door. NEIGHBORS 2: SORORITY RISING Movie Review Here! Mac Radner and his wife Kelly (played by Rose Byrne) have just settled in to their newly acquired home, which that have spent “ALL” of their money on, with their newborn child when Teddy and his frat move next door and turn the neighborhood upside down. If you’ve just had a little baby girl the last thing you want her doing is growing up next door to a frat house full of partying, horny, and shirtless boys but unfortunately that is the situation Mac and Kelly have been placed in. As if sleep weren’t hard enough to come by with a newborn throw in a 24 hour party next door and you can forget about ever sleeping again. After Mac’s attempt at peace by befriending the frat fails Mac spends the rest of the movie trying to get the frat to move, kicked out of the neighborhood, or arrested while Teddy tries to make Mac and Kelly’s life a living hell. Mac and Kelly are a textbook case of not yet ready to grow-up and embrace their thirty-something ages. Faced with the major life-shift of raising a baby gives them a rude-awakening and strong contrast of what their lives once were by the reminder of the young college kids that moved next door. After complaining about the noise one night, Teddy (Zach Efron) and the fraternity vice-president Pete (played by Dave Franco – yes, brother of James Franco) decide to try to win them over on their side – as they have with all of the neighbors, by inviting them into the party. The “old people” (Mac and Kelly) gladly accept. However, the very next night, the couple break a promise that they made to Teddy, and this is when an all-out war between the neighbors start. That’s where the movie gets very interesting and even cartoonishly funny during some key scenes. You’ll know which ones they are. 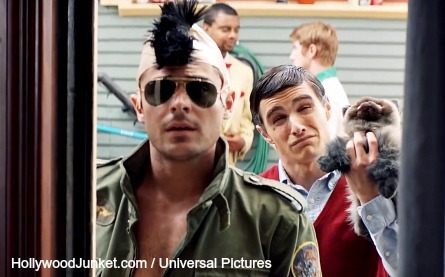 Pictured: Zac Efron as “Teddy” at his new frat house. Honestly I wasn’t sure if this premise could hold up for 90 minutes without being extremely repetitive but I’m amazed at how the writers were able to pull it off using some very sound logic. I’m sure veteran director Nicholas Stoller (The Five Year Engagement, Get Him To The Greek, Forgetting Sarah Marshall, etc) aided in this as well. Every time you would say to yourself “well why don’t they just do “this” that’s exactly what the couple would try or think and it wouldn’t work. For that I take my hat off. To me the film did take a little bit long to get going and no jokes really made me laugh out loud for at least the first ten minutes which isn’t very good for a comedy. Also most of the biggest surprise gags weren’t really surprises since they were in all of the commercials. There were a couple hidden gems though that didn’t include the two leads that were unpredictable and hysterical. Most of these included fairly unknown Jerrod Carmichael who played frat member Garf. You may remember him from the memorable role he provided in the short lived FOX series The Goodwin Games but if not I’m sure you’ll know his name soon as he is a bonified comedic star. Other supporting cast members such as Rose Byrne, Dave Franco, Christopher Mintz-Plasse, Lisa Kudrow, and Hannibal Buress who played a typical Los Angeles cop pretty well, provided the film with some of it’s biggest laughs as well. Not to give all credit to the supporting cast, and even though Seth Rogen was the great Seth everyone loves, I must say the best performance belongs to Zac Efron in what is one of his best leading performance yet. I feel the role provided him an opportunity to show us sides of him we haven’t seen (except in glimpse in Grown Ups 2) but worked as he’d been doing these type of characters for a decade. You can tell when an actor genuinely enjoys what he’s doing and Zac had fun bringing the party to college and to the movie. Hopefully he’ll do more comedies in this lane. 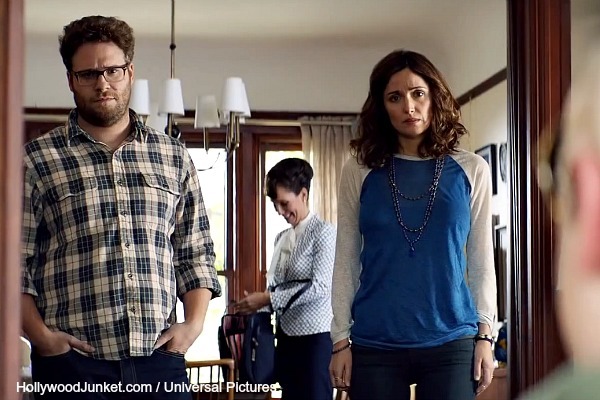 “Neighbors” movie opens in theaters Friday, May 9, 2014.